A beloved ice cream chain and restaurant will be returning to the Atlanta area early next year after an approximately 30 year absence. Farrell’s Restaurant and Ice Cream Parlour will be opening at the Battery Atlanta this February, sharing space with Sweet Pete’s, a gourmet candy shop. The two businesses will share a roughly 10,000 square foot space adjacent to Wahlburger's and across from CRU, a wine bar and restaurant in The Battery Atlanta at SunTrust Park. Bob Farrell and his business partner opened the original Farrell's in Portland, Oregon in 1963. The parlors feature an early 1900s, "Americana" theme, with employees wearing period dress and straw boater hats. In 1972, the Farrell's chain was purchased by the Marriott Corporation and by 1975, there were nearly 130 Farrell's nationwide. Under Marriott's ownership, the chain lost its way and thereafter, sales steadily declined. (Many hotel experts suggest that Marriott's purchase of The Ritz-Carlton in 1998 weakened the luxury brand's status and negatively impacted their once stellar reputation.) In 1982, Marriott sold the Farrell's chain to a group of private investors and by 1990 almost all locations had closed. Parlour Enterprises brought the brand back from the dead in 2009 with the ill-advised opening of seven Farrell's locations in California within a very short period of time. President Paul Kramer and his business partner Mike Fleming got into debt and were featured on the hit CNBC reality show "The Profit" last year as they worked with billionaire investor Marcus Lemomis to save the business. Although Lemonis was initially only an investor in the company, Kramer and Fleming reportedly exited the business earlier this year, leaving Lemonis now fully in charge. Sweet Pete’s, like Farrell's, was featured on "The Profit," with Lemonis now a 50% shareholder in the candy business. Peter and Allison Behringer are the founders of Jacksonville, Florida-based Sweet Pete's with Peter crafting his candy-making skills working for his family's business, Peterbrooke Chocolatier. Peterbrooke, also based in Jacksonville, is a chocolate franchise with one Atlanta location at The Forum in Norcross. Although it was known that Sweet Pete's would be opening in The Battery, the revelation that they will be joined by Farrell's was only recently revealed by my friends at Scoop OTP. The Atlanta location will mark the first time that the two brands are under the same roof in a newly opened location. (Sweet Pete's was added to the existing Farrell's restaurant in Buena Park, California.) The two businesses pair well together with Sweet Pete's bringing some originality to the candy offerings of Farrell's that Lemonis called non- "curated" and of convenience store quality. Sweet Pete's will offer their wide range of fresh made confectionery treats on the first floor, while Farrell's will operate a walk-up ice-cream counter on the first floor and full service restaurant on the second floor. 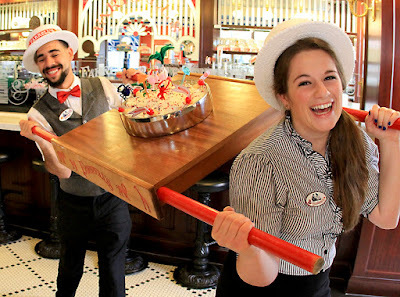 Patrons can look forward to reliving their childhood with specialty ice cream sundae desserts including "The Zoo" and "Pig Trough" at Farrell's, and children can learn the art of candy-making with plans for Sweet Pete's to offer candy-making classes, field trips and birthday parties. A lot has changed in the years since Farrell's was in Atlanta. The Battery, the new mixed-use complex in Cobb county actually already has an ice cream shop, national chain Häagen-Dazs, so Farrell's will have to be extra special. Denim & Soul, another company in which Lemonis invested on "The Profit," did not fare well in its expansion to Atlanta. The clothing boutique opened at The Shops Buckhead Atlanta at the end of 2015 and less than six months later, in the spring of 2016, had closed. With luck, the nostalgia and originality of Farrell's and Sweet Pete's will make them popular attractions but a better Braves season in 2018 would also be good for all involved. Are you excited for the return of Farrell's to Atlanta? What is your fondest memory of Farrell's? Do you think The Battery will prove to be a home run for businesses or will it instead be a strike-out? that opened a Farrell's was quite entertaining. was waiting for this post! A poster on Facebook's "You've lived in the ATL a long time if you remember......" group posted this a week or so ago but I couldn't find confirmation of it anywhere, plus I was skeptical with the Haagen Daz in the same development. How did they not get an ice cream exclusive?!!? I'm excited to give it a try - had my birthday party at the Northlake location long ago! Oh my gosh, I'm so excited! I loved Farrell's when it was in Atlanta many years ago. I guess this is showing my age but I don't care. I will be there with my two grown daughters ordering a zoo as soon as it opens up. IMHO The Battery is a much better venue than the ballpark itself. Farrell's will be a great "family" addition for those that can afford to take their children to the Cobb Braves Complex. Noticed in some reading on their Facebook page and elsewhere that the new owner has made some changes to the concept, making it a lot less "Farrell's." Crossing my fingers that it's still as fun as I remember! When WILL they announce any changes at Northlake mall do you have any updates? or on North DeKalb Mall. Let's petition for Costco to come there. LOL, good luck with that! When will this open at the Battery?